Here at Southwest Indian Foundation we want to make sure that our Customers and Donors are completely satisfied. We believe that you are more than just a Customer or Donor, you are our friend and a partner in the fight to help Native Americans in need. I believe our reps are some of the best in the business and are standing by to answer any questions you may have. Online and phone orders received Monday - Friday before 2:00 p.m. Mountain Standard Time will be processed the same day. Online and phone orders order placed after 2:00 p.m. Mountain Standard Time will be processed the next business day. We will ship your package via UPS. Delivery takes from 4-7 business days depending on where you live. Online and phone orders received Monday - Friday before 2:00 PM MT will be shipped the same business day. Orders received after 2:00 PM MT are scheduled to ship the next business day. All USPS Priority packages are delivered Monday - Friday. UPS 2-Day residential deliveries generally arrive by 8:00 PM. UPS 2-Day is not available to P.O. Boxes. You must provide a street address. UPS 2-Day is not available for orders being shipped outside the USA. UPS 2-Day orders must be placed by 10:00 AM Mountain to go out that day. UPS Overnight residential deliveries generally arrive by 8:00 PM. UPS Overnight is not available to P.O. Boxes. You must provide a street address. UPS Overnight is not available for orders being shipped outside the USA. UPS 2-Day orders must be placed by 10:00 AM Mountain to go out that day. Online and phone orders received Monday - Friday before 2:00 p.m. Mountain Standard Time Monday - Friday will be processed the same day. Online and phone orders order placed after 2:00 p.m. Mountain Standard Time will be processed the next business day. We will ship your package via UPS. Delivery takes from 4-7 business days depending on where you live. We do our best to process orders within 2-3 business days of your online transaction. Delivery cost depends on destination, weight and priority. Our international shipping service offers a guaranteed order total including all transportation costs and importation fees (Any applicable duty and tax enforced by the customs and revenue authorities in the destination country) during checkout. Both the shipping cost and importation fees vary by country. These charges are non-refundable - international shipping charges and any fees such as Duty, Tax, or VAT will not be refunded in the event of a return. Any shipping, duty, tax, or importation fee or charge associated with an international return is solely the responsibility of the purchaser. Southwest Indian Foundation will not cover any charge associated with shipping any item(s) back to the United States and reserves the right to refuse returns in the event that any duty, tax, or importation fee is requested upon delivery back to our facilities. If all shipping, duty, tax, and importation fees have been covered by the purchaser and a return is received from outside the United States, we will issue a refund to the original form of payment for the merchandise only. Any shipping, duty, tax, or importation fees that were paid upfront on the original transactions are non-refundable. 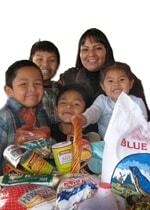 If you would like to make an international return, please ship item prepaid to Southwest Indian Foundation, 100 West Coal Ave, Gallup, NM 87301. It is very important to provide the following information on the return commercial invoice/international paperwork... order number, date of order, tracking #, description of item being returned, price paid for merchandise, and the following statement... US GOODS RETURNED. Once return item is received, we will credit your account and send you an email confirmation of credit transaction. You are more than welcome to contact us via Email or by calling us at 877.788.9962 and speaking to one of our customer service professionals. Emailing us is the quickest and easiest method. We'll be happy to answer any questions, concerns, or inquiries you have regarding International shipments. Rest assured and have the peace of mind that Southwest Indian Foundation will handle your International order professionally and promptly. Donations Donations can be made online, by phone (1-877-788-9962) using your Credit card, or by check using the order form in the center of our print catalog. After you make a donation your will receive a letter indicating the amount of your donation and details about the project that you donated to. Donations are 100% tax deductible and 65% of the cost of all purchases are tax deductible. Your credit card will be charged when the order is processed. Back-ordered items will not be charged to your card until the merchandise is available. You can call or email our customer service department for measurements on any item.